Hershey looking for the "good stuff." 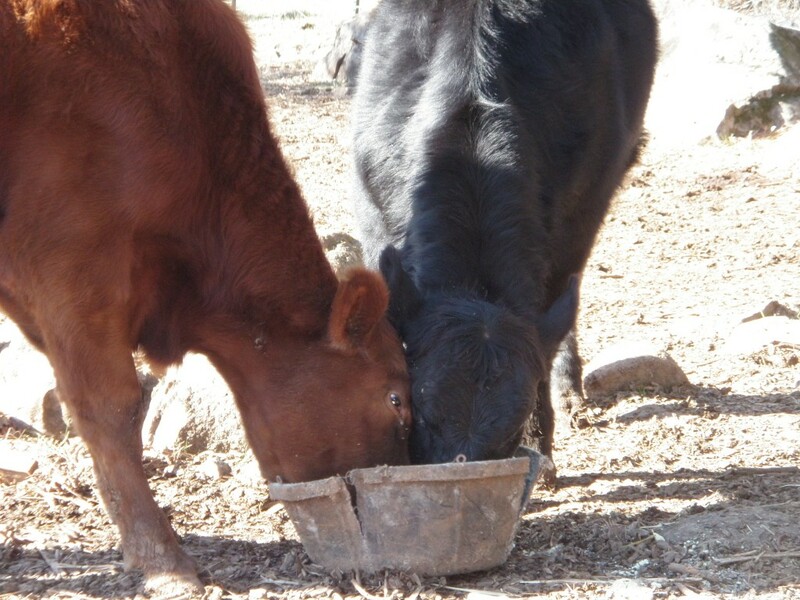 We added kelp and granular salt to the feed ration for our cows and stallion the other day. Since we already feed them a milled grain byproduct, I mixed the new stuff into the grain, which they normally devour, fight over and generally inhale within minutes. The reactions left us in stitches. Maybelle the milk cow took one look in the manger and tried to put her head through a different stanchion to see if there was better stuff there. Once she realized she was going to have to get in her regular stanchion, she tried blowing the new stuff away by snorting at it. She snuffled over the entire offering, taking an occasional tentative lick, then started using her tongue to scoop off the offending new material. When she realized she was actually just mixing in the new stuff, she changed tactics and swept everything to the side of the feed box. During this process she periodically raised her head and glared at me, twitched her tail and displayed the signs of a thoroughly aggravated cow. By the time we finished milking, she had eaten about half of what she normally does. Then she watched me suspiciously to be sure that I was really giving her alfalfa, and not some new-fangled hay. Maybelle’s daughter, Hersey, who is the greediest heifer I’ve ever seen, went from one feed bucket to another. “Does her bucket have the good stuff? I’d better go check.” “Does it taste better if I tip the bucket over and eat it from the ground?” “Once I’ve tipped the bucket over, can I eat it from the bottom of the bucket instead of the top?” “What if I sneak up on it? 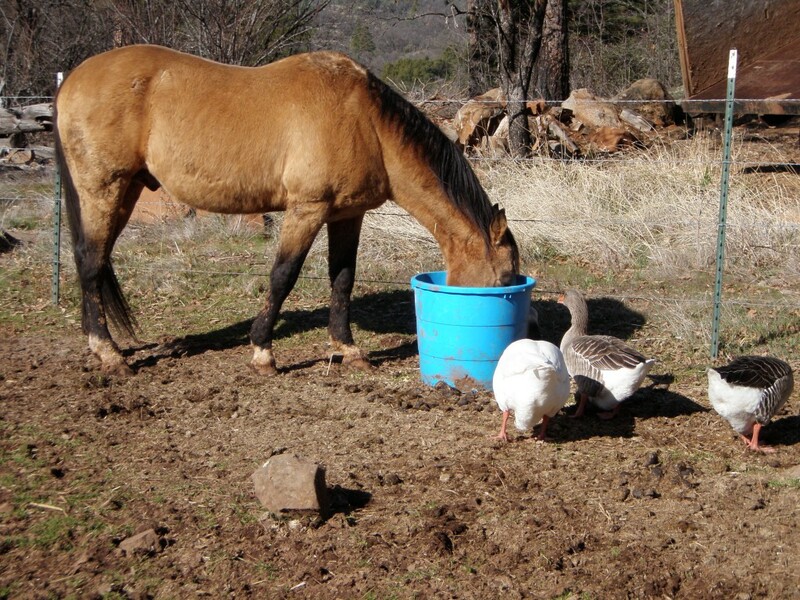 Will that put the old feed ration in the bucket?” “OK, I give up – I’ll just go eat hay.” For the first time in her entire existence, she left grain uneaten. 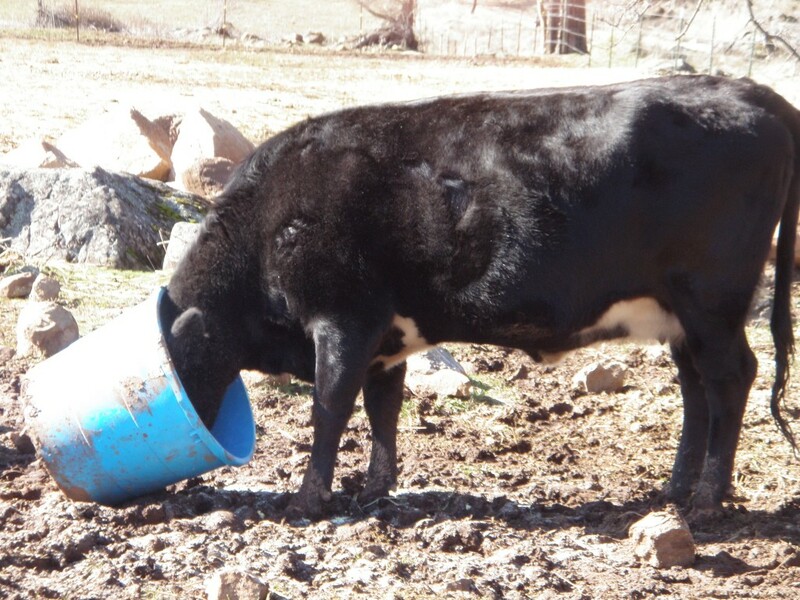 Strawberry, the red Angus cow, circled the buckets a couple of times, but did eat a fair amount before following Hershey off to the hay. Mama, can I see if yours tastes better? All of the animals except Maybelle engaged in a game of musical food buckets for about three days. They were sure there must be something better in the next bucket over. Maybelle, having decided we were trying to poison her, suddenly “forgot” how to walk into the milking shed. Normally, when you raise the bar, you’d better leap out of the way, because you’re standing between Maybelle and her grain. Today we had to put the halter on and engage in a tug of war to get her in. She did, however, eat every scrap of the grain even with the additional supplements, and licked the feed box clean. Don't bother me, birds, can'tcha see I'm eating? !